Announcing an important extra wideband addition to its already wide range of $ Saver Power Splitters/Dividers. The new low cost Power Dividers, Dx-69FN series, are available as 2, 3, 4, 6 and 8 way configurations, all covering from 698 to 2,700 MHz to not only include the cellular, PCS and UMTS bands but the new LTE-700 and LTE-2600 bands. Microlab/FXR Model Dx-69FN series of Wilkinson style Power Dividers has been designed for low power applications where output isolation is preferable over lowest possible loss. The wide frequency range of this design allows use with multi-band antennas and leaky cable systems. A similar series Dx-69FF, provides similar specifications but with SMA connectors. 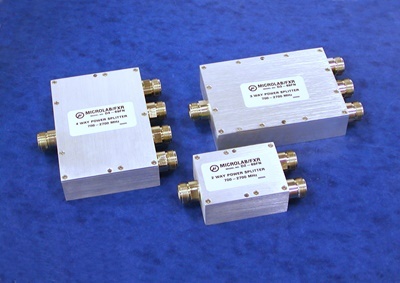 Even lower loss dividers which enhance receive sensitivity and preserve transmitted power over the same wideband are also available from Microlab/FXR in the Dx-19FN series. These Power Dividers are available for immediate delivery from Microlab/FXR and selected distributors. For complete details call 'Sales' at Microlab/FXR on (973) 386-9696 or check the Internet at www.microlab.fxr.com.